Population transfer in the Soviet Union refers to forced transfer of various groups from the 1930s up to the 1950s ordered by Joseph Stalin and may be classified into the following broad categories: deportations of "anti-Soviet" categories of population (often classified as "enemies of workers"), deportations of entire nationalities, labor force transfer, and organized migrations in opposite directions to fill the ethnically cleansed territories. In most cases, their destinations were underpopulated remote areas (see Forced settlements in the Soviet Union). This includes deportations to the Soviet Union of non-Soviet citizens from countries outside the USSR. It has been estimated that, in their entirety, internal forced migrations affected at least 6 million people. Of this total, 1.8 million kulaks were deported in 1930–31, 1.0 million peasants and ethnic minorities in 1932–39, whereas about 3.5 million ethnic minorities were further resettled during 1940–52. Some 1 to 1.5 million perished as a result of the deportations — of those deaths, the deportation of Crimean Tatars and the deportation of Chechens were recognized as genocides by Ukraine and the European Parliament respectively. Kulaks were a group of relatively affluent farmers and had gone by this class system term in the later Russian Empire, Soviet Russia, and early Soviet Union. They were the most numerous group deported by the Soviet Union. Resettlement of people officially designated as kulaks continued until early 1950, including several major waves. Large numbers of kulaks regardless of their nationality were resettled to Siberia and Central Asia. According to data from Soviet archives, which were published in 1990, 1,803,392 people were sent to labor colonies and camps in 1930 and 1931, and 1,317,022 reached the destination. Deportations on a smaller scale continued after 1931. The reported number of kulaks and their relatives who had died in labour colonies from 1932 to 1940 was 389,521. It is estimated that 15 million kulaks and their families were deported by 1937, during the deportation many people died, but the full number is not known. During the 1930s, categorisation of so-called enemies of the people shifted from the usual Marxist–Leninist, class-based terms, such as kulak, to ethnic-based ones. The partial removal of potentially trouble-making ethnic groups was a technique used consistently by Joseph Stalin during his government; between 1935 and 1938 alone, at least nine different nationalities were deported. Germany's invasion of the Soviet Union led to a massive escalation in Soviet ethnic cleansing. The Deportation of Koreans in the Soviet Union, originally conceived in 1926, initiated in 1930, and carried through in 1937, was the first mass transfer of an entire nationality in the Soviet Union. Almost the entire Soviet population of ethnic Koreans (171,781 persons) were forcefully moved from the Russian Far East to unpopulated areas of the Kazakh SSR and the Uzbek SSR in October 1937. Looking at the entire period of Stalin's rule, one can list: Poles (1939–1941 and 1944–1945), Romanians (1941 and 1944–1953), Lithuanians, Latvians, Estonians (1941 and 1945–1949), Volga Germans (1941–1945), Ingrian Finns (1929–1931 and 1935–1939), Finnish people in Karelia (1940–1941, 1944), Crimean Tatars, Crimean Greeks (1944) and Caucasus Greeks (1949–50), Kalmyks, Balkars, Karachays, Meskhetian Turks, Karapapaks, Far East Koreans (1937), Chechens and Ingushs (1944). Shortly before, during and immediately after World War II, Stalin conducted a series of deportations on a huge scale which profoundly affected the ethnic map of the Soviet Union. It is estimated that between 1941 and 1949 nearly 3.3 million were deported to Siberia and the Central Asian republics. By some estimates, up to 43% of the resettled population died of diseases and malnutrition. After the Soviet invasion of Poland following the corresponding German invasion that marked the start of World War II in 1939, the Soviet Union annexed eastern parts (known as Kresy to the Polish or as West Belarus and West Ukraine in the USSR and among Belarusians and Ukrainians) of the Second Polish Republic, which since then became western parts of the Belarusian SSR and the Ukrainian SSR. During 1939–1941, 1.45 million people inhabiting the region were deported by the Soviet regime. According to Polish historians, 63.1% of these people were Poles and 7.4% were Jews. Previously it was believed that about 1.0 million Polish citizens died at the hands of the Soviets, but recently Polish historians, based mostly on queries in Soviet archives, estimate the number of deaths at about 350,000 people deported in 1939–1945. The same followed in the Baltic republics of Latvia, Lithuania and Estonia (see Soviet deportations from Estonia and Soviet deportations from Lithuania). More than 200,000 people are estimated to have been deported from the Baltic in 1940–1953. In addition, at least 75,000 were sent to the Gulag. 10% of the entire adult Baltic population was deported or sent to labor camps. In 1989, native Latvians represented only 52% of the population of their own country. In Estonia, the figure was 62%. In Lithuania, the situation was better because the migrants sent to that country actually moved to the former area of Eastern Prussia (now Kaliningrad) which, contrary to the original plans, never became part of Lithuania. During World War II, particularly in 1943–44, the Soviet government conducted a series of deportations. Some 1.9 million people were deported to Siberia and the Central Asian republics. Treasonous collaboration with the invading Germans and anti-Soviet rebellion were the official reasons for these deportations. Out of approximately 183,000 Crimean Tatars, 20,000 or 10% of the entire population served in German battalions. Consequently, Tatars too were transferred en masse by the Soviets after the war. Vyacheslav Molotov justified this decision saying "The fact is that during the war we received reports about mass treason. Battalions of Caucasians opposed us at the fronts and attacked us from the rear. It was a matter of life and death; there was no time to investigate the details. Of course innocents suffered. But I hold that given the circumstances, we acted correctly." Historian Ian Grey writes "Towards the Moslem peoples, the Germans pursued a benign, almost paternalistic policy. The Karachai, Balkars, Ingush, Chechen, Kalmucks, and Tatars of the Crimea all displayed pro-German sympathies in some degree. It was only the hurried withdrawal of the Germans from the Caucasus after the battle of Stalingrad that prevented their organizing the Moslem people for effective anti-Soviet action. The Germans boasted loudly, however, that they had left a strong “fifth column” behind them in the Caucasus." Poland and Soviet Ukraine conducted population exchanges; Poles who resided east of the established Poland–Soviet border were deported to Poland (c.a. 2,100,000 persons) and Ukrainians that resided west of the established Poland-Soviet Union border were deported to Soviet Ukraine. Population transfer to Soviet Ukraine occurred from September 1944 to April 1946 (ca. 450,000 persons). Some Ukrainians (ca. 200,000 persons) left southeast Poland more or less voluntarily (between 1944 and 1945). In February 1956, Nikita Khrushchev in his speech On the Personality Cult and its Consequences condemned the deportations as a violation of Leninist principles. His government reversed most of Stalin's deportations. Some peoples were deported after Stalin's death: in 1959, Chechen returnees were supplanted from the mountains to the Chechen plain. The mountain peoples of Tajikistan, such as the Yaghnobi people, were forcibly settled to the desert plains in the 1970s. According to a secret Soviet ministry of interior report dated December 1965, for the period 1940—1953, 46,000 people were deported from Moldova, 61,000 from Belarus, 571,000 from Ukraine, 119,000 from Lithuania, 53,000 from Latvia and 33,000 from Estonia. The interpretation of this Agreement resulted in the forcible repatriation of all Soviet citizens regardless of their wishes. 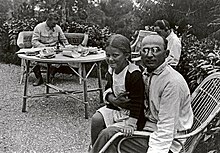 British and U.S. civilian authorities ordered their military forces in Europe to deport to the Soviet Union millions of former residents of the USSR (some of whom collaborated with the Germans), including numerous persons who had left Russia and established different citizenship many years before. The forced repatriation operations took place from 1945–1947. Surviving POWs, about 1.5 million, repatriated Ostarbeiter, and other displaced persons, totally more than 4,000,000 people were sent to special NKVD filtration camps (not Gulag). By 1946, 80% civilians and 20% of PoWs were freed, 5% of civilians, and 43% of PoWs re-drafted, 10% of civilians and 22% of PoWs were sent to labor battalions, and 2% of civilians and 15% of the PoWs (226,127 out of 1,539,475 total) transferred to the NKVD, i.e. the Gulag. ... the same principles that informed Soviet nation building could and did lead to ethnic cleansing and ethnic terror against a limited set of stigmatized nationalities, while leaving nation-building policies in place for the majority of nonstigmatized nationalities. The number of deaths attributed to deported people living in exile is considerable. The causes for such demographic catastrophe lie in harsh climates of Siberia and Kazakhstan, disease, malnutrition, work exploitation which lasted for up to 10 hours daily as well as any kind of appropriate housing or accommodation for the deported people. 1948—1951 Azeris 100,000 Armenia Kura-Aras Lowland, Azerbaijan "Measures for resettlement of collective farm workers"
^ Polian 2004, p. 4. ^ Rosefielde, Steven (2009). Red Holocaust. Routledge. p. 83. ISBN 978-0-415-77757-5. ^ a b Ellman 2002, p. 1159. ^ Rosefielde, Steven (2009). Red Holocaust. Routledge. p. 84. ISBN 978-0-415-77757-5. ^ "Gulag: Soviet Forced Labor Camps and the Struggle for Freedom". Gulaghistory.org. Retrieved 2015-02-17. ^ Martin 1998, p. 815. Poles, Germans, Finns, Estonians, Latvians, Koreans, Chinese, Kurds, and Iranians. ^ Martin 1998, p. 820. ^ Stephen Wheatcroft. "The Scale and Nature of German and Soviet Repression and Mass Killings, 1930–45" (PDF). Sovietinfo.tripod.com. Retrieved 17 February 2015. ^ Boobbyer, Philip (2000). The Stalin Era – Philip Boobbyer – Google Books. ISBN 9780415182980. Retrieved 2015-02-17. ^ "Table 1B : Soviet Transit, Camp and Deportation Death Rates" (GIF). Hawaii.edu. Retrieved 17 February 2015. ^ "European WWII Casualties". Project InPosterum. Retrieved 2015-02-17. ^ "Piotr Wrobel. The Devil's Playground: Poland in World War II". Warsawuprising.com. Retrieved 2015-02-17. ^ "Taigi veebimüük | Taig.ee". Rel.ee. Archived from the original on 1 March 2001. Retrieved 2015-02-17. ^ Misiunas, Romuald J. and Rein Taagepera. (1983). Baltic States: The Years of Dependence, 1940–1980. University of California Press. Hurst and Berkley. ^ "east-west-wg.org". east-west-wg.org. Archived from the original on 13 September 2014. Retrieved 17 February 2015. ^ "Europe | Remembering Stalin's deportations". BBC News. 2004-02-23. Retrieved 2015-02-17. ^ Jean-Christophe Peuch. "World War II – 60 Years After: For Victims Of Stalin's Deportations, War Lives On". Rferl.org. Retrieved 2015-02-17. ^ "MEDIA REPORTS | Crimean Tatars mark wartime deportations". BBC News. 2002-05-18. Retrieved 2015-02-17. ^ "MIGRATION CITIZENSHIP EDUCATION – Forced migration in the 20th century". Migrationeducation.org. Archived from the original on 21 October 2015. Retrieved 17 February 2015. ^ Mawdsley 1998, p. 73. ^ "Getman Paintings | The Jamestown Foundation". Jamestown.org. 20 January 2015. Archived from the original on 24 October 2008. Retrieved 17 February 2015. ^ "Final Compensation Pending for Former Nazi Forced Laborers | Germany | DW.DE | 27.10.2005". Dw-world.de. Retrieved 2015-02-17. ^ "The Nazi Ostarbeiter (Eastern Worker) Program". Collectinghistory.net. 1922-06-26. Retrieved 2015-02-17. ^ Polian 2004, pp. 125–126. ^ Davoliūtė 2014, p. 29. ^ Martin 1998, p. 816–817. ^ Pohl 1999, p. 46. ^ Frucht 2004, p. 28. ^ a b c d D.M. Ediev (2004). "Demograficheskie poteri deportirovannykh narodov SSSR". Stavropol: Polit.ru. Retrieved 23 September 2017. ^ Pohl 1999, p. 14. ^ a b Pettai & Pettai 2014, p. 55. ^ "'Confusion, a lot of emotions inside. A bit of fear, concern and anticipation'". The Siberian Times. 22 July 2012. Retrieved 23 July 2017. ^ a b c d e f g Buckley, Ruble & Hofmann 2008, p. 207. ^ a b c d e f Rywkin 1994, p. 67. ^ Pohl 2000, p. 267. ^ Griffin 2004, p. 40. ^ Williams 2015, p. 109. ^ Dundovich, Gori & Guercetti 2003, p. 76. ^ Viola 2007, p. 32. ^ a b c d Polian 2004, p. 328. ^ Polian 2004, p. 98. ^ a b c d e ""Punished Peoples" of the Soviet Union: The Continuing Legacy of Stalin's Deportations" (PDF). New York: Human Rights Watch. September 1991. Retrieved 30 June 2017. ^ Polian 2004, p. 329. ^ Dundovich, Gori & Guercetti 2003, p. 77. ^ Dundovich, Gori & Guercetti 2003, p. 100. ^ Salitan 1992, p. 74. ^ a b c Bugay 1996, p. 156. ^ Askerov 2015, p. 12. ^ Polian 2004, p. 33¸1. ^ Korostelina 2007, p. 9. ^ Polian 2004, p. 332. ^ McColl 2014, p. 803. ^ Saparov, Arseny (2003). The alteration of place names and construction of national identity in Soviet Armenia. 44. Cahiers du monde russe. pp. 179–198. ^ a b c Dundovich, Gori & Guercetti 2003, p. 102. ^ Baran 2016, p. 62. Council of Europe (2007-03-19). Documents: working papers, 2006 ordinary session (third part), 26–30 June 2006, Vol. 4: Documents 10868, 10886, 10893, 10903-10950. p. 158. ISBN 9789287160270. Askerov, Ali (2015). Historical Dictionary of the Chechen Conflict. Rowman & Littlefield. p. 12. ISBN 9781442249257. LCCN 2015-000755. Baran, Emily B. (2016). Dissent on the Margins: How Soviet Jehovah's Witnesses Defied Communism and Lived to Preach about It (repeated ed.). Oxford University Press. ISBN 978-0190495497. Buckley, Cynthia J.; Ruble, Blair A.; Hofmann, Erin Trouth (2008). Migration, Homeland, and Belonging in Eurasia. Woodrow Wilson Center Press. p. 207. ISBN 978-0801890758. LCCN 2008-015571. Bugay, Nikolay (1996). The Deportation of Peoples in the Soviet Union. Nova Publishers. ISBN 978-1560723714. Davoliūtė, Violeta (2014). The Making and Breaking of Soviet Lithuania: Memory and Modernity in the Wake of War. Routledge. ISBN 9781134693580. Dundovich, Elena; Gori, Francesca; Guercetti, Emanuela (2003). Reflections on the Gulag: With a Documentary Index on the Italian Victims of Repression in the USSR (37 ed.). Greenwood Publishing Group. ISBN 978-8807990588. Ellman, Michael (2002). "Soviet Repression Statistics: Some Comments" (PDF). Europe-Asia Studies. 54 (7): 1151–1172. doi:10.1080/0966813022000017177. JSTOR 826310. Frucht, Richard C. (2004). Eastern Europe: an introduction to the people, lands, and culture. 2. ABC-CLIO. p. 28. ISBN 978-1576078006. Griffin, Nicholas (2004). Caucasus: A Journey to the Land Between Christianity and Islam. Chicago: University of Chicago Press. ISBN 9780226308593. LCCN 2003063352. Korostelina, K. (2007). Social Identity and Conflict: Structures, Dynamics, and Implications. Springer. p. 9. ISBN 9780230605671. Martin, Terry (1998). "The Origins of Soviet Ethnic Cleansing" (PDF). The Journal of Modern History. 70 (4): 813–861. doi:10.1086/235168. JSTOR 10.1086/235168. Mawdsley, Evan (1998). The Stalin Years: The Soviet Union, 1929-1953. Manchester University Press. ISBN 9780719046001. LCCN 2003046365. McColl, R.W. (2014). Encyclopedia of World Geography - Facts on File library of world geography. Infobase Publishing. p. 803. ISBN 9780816072293. OCLC 58431770. Pettai, Eva-Clarita; Pettai, Vello (2014). Transitional and Retrospective Justice in the Baltic States. Cambridge University Press. ISBN 978-1107049499. LCCN 2014-043729. Pohl, J. Otto (1999). Ethnic Cleansing in the USSR, 1937–1949. Westport, CT: Greenwood Press. ISBN 978-0-313-30921-2. LCCN 98-046822. Pohl, J. Otto (2000). "Stalin's genocide against the "Repressed Peoples"". Journal of Genocide Research. 2 (2): 267–293. doi:10.1080/713677598. Polian, Pavel (2004). Against Their Will: The History and Geography of Forced Migrations in the USSR. Budapest: Central European University Press. ISBN 978-9-639-24168-8. Rywkin, Michael (1994). Moscow's Lost Empire. Routledge. ISBN 9781315287713. LCCN 93029308. Salitan, Laurie P. (1992). Rosemary Thorp, ed. Politics and Nationality in Contemporary Soviet-Jewish Emigration, 1968-89. Springer. ISBN 978-1349097562. Sanford, George (2007). Katyn and the Soviet Massacre of 1940: Truth, Justice and Memory. Routledge. ISBN 9781134302994. LCCN 2004-065124. Viola, Lynne (2007). The Unknown Gulag: The Lost World of Stalin's Special Settlements. Oxford University Press. p. 32. ISBN 9780195187694. Williams, Brian Glyn (2015). The Crimean Tatars: From Soviet Genocide to Putin's Conquest. London, New York: Oxford University Press. ISBN 9780190494728. LCCN 2015033355. Crimean Autonomous Soviet Socialist Republic was an Autonomous Soviet Socialist Republic of the Russian SFSR located on the Crimean Peninsula. The Soviet Union (USSR) was a federation made up of 15 socialist republics, and existed from 1922 until its dissolution in 1991. Six of the 15 republics had a Muslim majority: Azerbaijan, Kazakhstan, Kirghizia, Tajikistan, Turkmenistan, and Uzbekistan. There was also a large Muslim population in the Volga-Ural region and in the northern Caucasus region of the Russian Soviet Federative Socialist Republic. A large number of Tatar Muslims also lived in Siberia and other regions. The Deportation of the Chechens and Ingush, also known as Aardakh, Operation Lentil was the Soviet forced transfer of the whole of the Vainakh populations of the North Caucasus to Central Asia on February 23, 1944, during World War II. The expulsion, preceded by the 1940–1944 insurgency in Chechnya, was ordered by NKVD chief Lavrentiy Beria after approval by Soviet Premier Joseph Stalin, as a part of a Soviet forced settlement program and population transfer that affected several million members of non-Russian Soviet ethnic minorities between the 1930s and the 1950s. Uzeir Abduramanovich Abduramanov was a sapper in the Red Army during the German-Soviet War. After securing the safe transfer of troops across the Sozh river under heavy enemy fire and through icy water, he was declared a Hero of the Soviet Union on 15 January 1944. Despite having served in the Red Army throughout the entire war and achieving recognition for his bravery, he was still deported to Uzbekistan in 1945 because of his Crimean Tatar ethnicity. His entire family had also suffered exile in the deportation of 1944.